Why I read this book: I love Tim Gunn from project runway and I liked his first book. I thought I would give this a try. Tim Gunn. Tim Gunn is awesome. There. It just had to be said. He is probably the sole reason I started watching Project Runway during college (well that and Bravo's damn Saturday marathons). So it begs to reason that if Tim Gunn is awesome, his book would be so as well. Yup! That certainly holds true in this case. 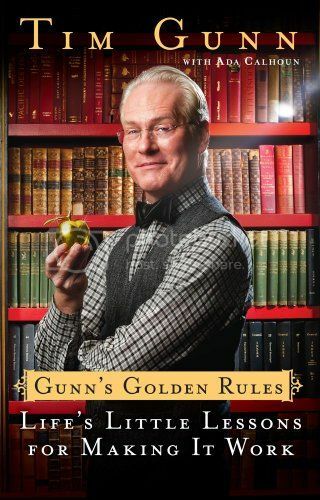 Gunn's Golden Rules is a nice little book filled with anectodes from Tim Gunn's life. And wow has he led an interesting life! They are all tied together throughout the chapter headings, each represening a rule Mr. Gunn lives his life by. Though I don't know too much of the fashion world, each story he had to share about it was really interesting. Stories about horrid spoiled children to horrid spoiled fashion people are scattered throughout these pages. Sprinkled in are stories from Mr. Gunn's personal life, all of which are equally as entertaining! Though his first book was more of a How To, the title is a little deceiving as this is more of a memoir bound by the thread of rules. I really liked it regardless of it being different than what I thought it would be. I would recommend this book to people who like Tim Gunn, fashion, or just interesting memoirs. If that is not you then maybe you should pass, though it was a relatively quick read. I will have to check this out. My roommie loves Project Runway, and Tim Gunn is the only part that doesn't drive me nutty. He seems like such an amazing man. Not only do I love Project Runway, but I've actually been to a fashion show/talk that Tim Gunn hosted. I had no idea this book was like a memoir. Going to add it to my TBR list now! I love Tim! I think he should marry Anderson Cooper. I have a crush on Tim Gunn. Love all the Tim Gunn love! I love Tim! I definitely have to get this book now. Tim Gunn is such a badass. I love him so. I love Tim Gunn too and I also loved this book. :) I'm posting my review next week but I said many of the same things you did.. he is just awesome. I'm glad you liked it! Link it here and I'll check it out once its posted.